Posted By:Unknown | At:7:45 AM Be the first to comment! LOS ANGELES – There was never supposed to be a video. Matt Kemp's uncommon act of kindness was never supposed to go farther than an ailing boy, his dad and the baseball star. And yet when Kemp awakened Tuesday morning, 36 hours afterward, his phone told him otherwise. The video was everywhere. No, there was never supposed to be evidence beyond the ailing boy's memory, and perhaps a shelf in his room. Maybe he's wearing Kemp's cap. Maybe he's still holding Kemp's gray road jersey and spikes. "I didn't know that anybody was filming it," Kemp said Tuesday afternoon. "I wasn't aware." 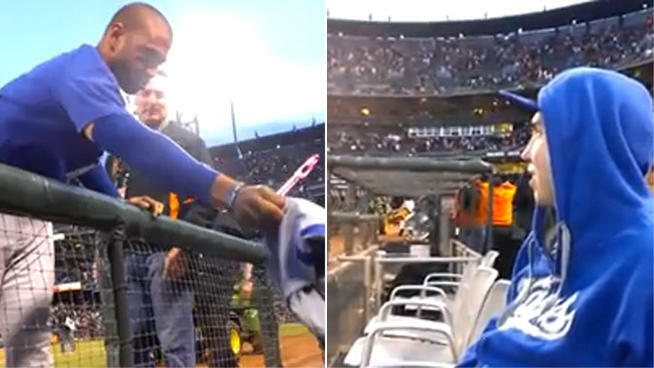 A boy, Joshua Jones, and his father, Steve Jones, sat Sunday night in front-row seats at AT&T Park in San Francisco. The boy was in a wheelchair. Early in the game between the Los Angeles Dodgers and San Francisco Giants, the father struck up a conversation with Dodgers third base coach Tim Wallach. He said his son was very sick, that he was a Dodgers fan, and that his favorite player was Kemp. The boy, who has cancer, is unable to speak. Wallach brought them a baseball. Later in the game, he told Kemp about Joshua. And when the game ended – Kemp had made the last out in a loss, the Dodgers' fourth in a row – Wallach returned to the dugout and found Kemp waiting for him. He wanted to go see the boy in the stands. In the video that was recorded and uploaded by Tommy Schultz, a friend of Joshua, Kemp and Wallach walk together toward the ailing boy and his father. Kemp reaches out to shake the Joshua's hand, and instead he gets a baseball, which the boy had in his right hand. Seated below field level, the boy looks with wide eyes as Kemp signs the baseball. The boy beams silently. Kemp returns the ball and then, in a ballpark full only a few minutes before, as onlookers laugh and cheer, Kemp removes his cap and hands it to the boy. He pulls his jersey – No. 27 – over his head and hands that, too, over the rail. And he unties his cleats, pulls off the right and then the left, and gives them to the boy so that his lap is piled with most of Matt Kemp's uniform. Wallach stands to the side. He watches. Steve had told him his boy was dying. "As a parent," Wallach said, "you can't even imagine what they're going through. You'd hate to have to imagine what they're going through." Kemp reaches back over the rail to shake the father's hand. Then the boy's. He smiles and then he is gone, and the boy's eyes follow Kemp as he leaves, cap-less, jersey-less, shoeless. And that was it. The video went dark. A minute or so that otherwise passed between the father and his ailing boy and the center fielder for the Dodgers, it would last a lifetime. And the world would witness it. "It's just something I felt probably would have cheered him up a little bit," Kemp said. "Help him out a little bit. I just did it. "Hopefully that made that kid's day." He paused. Such a small gesture, then it was time to go. There have been others like him. There will be others like him. "I don't even know the kid's name," Kemp said. By then, after another loss, in a season in which the talented Kemp is batting but .265 with a single home run and his Dodgers are in last place, Kemp had known there were smaller acts that meant bigger things. In that, a hello and a ball and an autograph weren't enough. The cap wouldn't be enough. The jersey wouldn't be enough. None of it would, perhaps, but it's what he had to give. That and an encouraging smile from an enemy Dodger in the land of Giants. "I just saw a kid there that was a big fan," Kemp said. "Hopefully, God-willing, a miracle happens and he lives for a while." Joshua smiled back best he could in a moment that was supposed to vanish, but wouldn't. On Tuesday morning, Kemp's phone was filled with messages. "What'd I do now?" he thought. It was the ailing boy, his father, and that minute Sunday night. Just that. All that. "You have some good stories and some sad stories," Kemp said. "God puts them there to remind you."